Yale School of Drama alumni have been featured in one play after another on the London stage these past few years. On Tuesday 29 June, you'll have the chance to catch the latest arrival and enjoy a drink with the playwright, director and actors after the show. Ever since Alexis, a young composer, moved in with her boyfriend in way uptown Manhattan, her pet parrot has been having an anxiety attack. What’s worse, Lee, the girl she’s been flirting with, just showed up uninvited to dinner - and Julian and Thomasina, “The Perfect Couple,” are due over any minute. And is it really a good idea to start downing shots of a so-called truth serum? Plucker is an old-school farce about a new generation dealing with the anxieties of commitment and co-habitation. Alena Smith’s plays have been seen at The Public Theater, Playwrights Horizons and P.S. 122 in New York and at Theater Bielefeld in Germany. Alena received her MFA from the Yale School of Drama where she was granted the ASCAP Cole Porter Prize in Playwriting. Anna G. Jones, director, trained at Cambridge University and the Yale School of Drama and ran Bone Orchard theatre company in New York from 2007-2009. “Exhilirating - one to watch.” Backstage. “An outstanding director”, Yale Daily News. 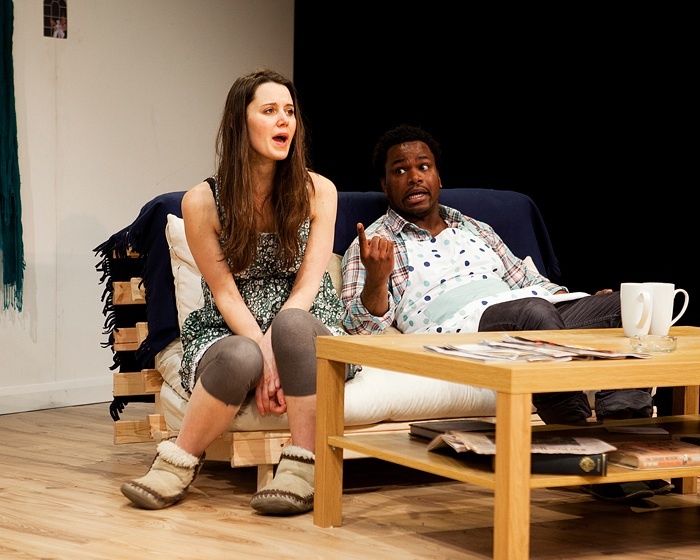 The trifecta of Drama School alumni is completed by actor Jamel Rodriguez, Drama School '08. Book tickets on the theatre's website and mention that you are part of a Yale Club of London group.